Based on "Kamulan" epigraph, Trenggalek was built in August 31, 1194. 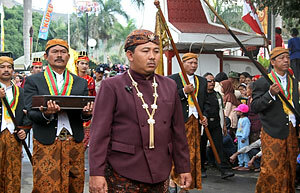 Traditional ceremony is annually carried out to celebrate the establishment of Trenggalek and this takes place in "Pendopo Kabupaten" (the Regency Hall). A processing is made by hundreds of people wearing Javanese traditional dresses move around along the main road of the ceremony. The people of Trenggalek are not only entertained with palm climbing, gunny bag race, etc, but an all night puppet shadow performance as well. A day before the anniversary, people make a devotional visit to sacred places and stay a whole night reciting the Holy Quran and singing "Mocopat" (six - line Javanese Verse Form).